1895/96: Received Certificate A in Industrial Drawing. Received honorable mention for the Henry Perry Leland Prize given by Mrs. John Harrison for work in Pen and Ink; $20 second prize for best set of drawings in the Course of Industrial Drawing. 1896/97: Received John T. Morris Prize of $10.00 for drawing of Details of the Human Figure; Jacob H. Weil Prize of an outfit of Oleo Water-Colors for best sketch in water-colors from Life. 1897/98: Honorable mention for the Mrs. George K. Crozer Prize offered for the best work in drawing; Caroline Axford Magee Prize of $20.00 for group of designs introducing decorative use of the human figure. At the Pennsylvania Academy of the Fine Arts, she studied with William Merritt Chase, and at his insistence, she entered competitions for various student awards. She won the Tappan prize in 1902, and was one of four artists to win the first two-year Cresson traveling scholarship in 1908, which afforded her the opportunity to go to France, Holland, Italy and Spain. She attended the Grande Chaumiere in Paris where she had the advantage of the critical counsel of both Rene Menard and Lucien Simon, but eventually she felt their strictly classical approach too restrictive to her progress, so she enrolled in the Academie Julian. Once again she grew weary of the boundaries of tradition and so established her own studio in the Rue de Bagneaux with several other young American women artists. It was at this point that she developed her infatuation and skill for plain-air subjects. Walter’s early work, 1900-1908, shows the very strong influence of William Merritt Chase. Her use of rich saturated colors, combined with her adept application of black paint was very successful. Black was a pigment extraordinarily difficult to master, and often omitted in the general course of American Impressionism. The quietude of Martha Walter’s Paris period lasted until about 1912 when she began to vivify her palette and concentrate on light and shadow. Upon her return to America, around the beginning of World War I, she favored the use of bright and intense colors as highlights in her beach scenes of Bass Rock, Gloucester and Atlantic City. Her works had more spontaneity, as she concentrated on hues rather than subjects. In this sense she was once again in league with the French Impressionists who were frequently more concerned with the color recorded than with the form drawn. The subtle dissolution of forms tended to accentuate the predominant central theme in her works. Her figures did not suffer; they merely became more elusive. Walter’s influence throughout her career was chiefly derived from the work and teachings of William Merritt Chase. She journeyed to the very places where Chase had painted – Shinnecock, Carmel, Paris, Holland, etc. Martha Walter had a studio in New York, taught at Chase’s New York School of Art and had a studio in Gloucester, and even taught in Brittany. She was continually traveling back and forth to Paris. While she was in France, Eugene Boudin proved to be another strong source of inspiration for her. Many of Walter’s beach scenes exhibit varying tones of gray, which are reminiscent of the atmospheric quality achieved in Boudin’s work. Many of Walter’s canvases are obviously distinct reflections of French Impressionism. Through it all though, she developed a style of painting, which was a uniquely Martha Walter, with bold dashing brush strokes in conjunction with total color control, and well organized composition. Her style reflected the sensitivity of her European predecessors, but maintained a vigor, which was definitely American. Cecelia Beaux offered favorable criticism of Walter’s work by saying that the beach scenes seemed as if they were blown onto the canvas. 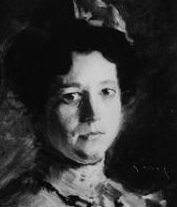 Walter visited Chattanooga, Tennessee, many times from 1903 to 1910, where she painted commissioned portraits and landscapes during the summer. Her ability to contrast her light and vibrant palette to the harsh reality of life in the mountains of Tennessee as expressed by the children that she saw and portrayed make the poignancy of the moment even more heart wrenching. Some of the children that she portrayed were so under-privileged that they didn’t even know the meaning of the word mountain. In 1922, Martha Walter was given an exhibition of her paintings at the Galleries George Petit in Paris. The French government purchased a painting entitled The Checquered Cape from this exhibition, for the Musee de Luxembourg. This picture was a study for a larger painting of the same name. In the 1930s, Martha Walter was represented by Milch Galleries in New York, and it was then that she began to travel to North Africa to paint her chromatic impressions of Tunis, Tripoli and Algiers. The harsh African sun lent the cafe scenes, camel markets, and souk transactions an intense but different color sense than her American and French subjects. The broad flat planes of the local architecture, combined with the flowing Arabian robes worn by the inhabitants, gave her renderings of sharply defined areas of color a new dynamic quality. From Africa, Walter traveled to the Dalmatian coast where she settled for a long enough time to paint dozens of bustling market scenes. Although well advanced in years, Martha Walter continued to paint until a few years before her death in 1976. She has been represented in the Museum collections of Musee de Luxembourg, Pennsylvania Academy of the Fine Arts, Art Institute of Chicago, Detroit Institute of Arts, Milwaukee Art Center, Toledo Museum and the Woodmere Art Center, Philadelphia.